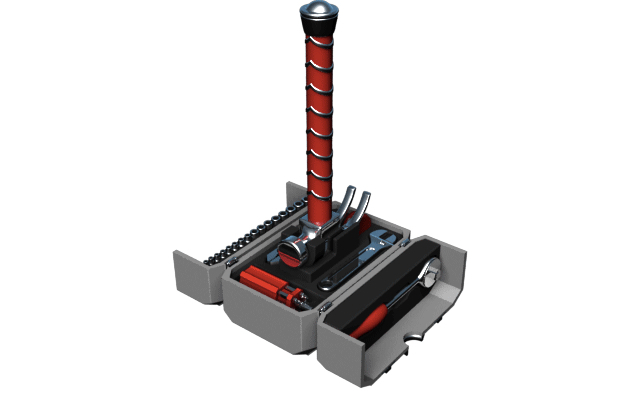 If you were a Norse god/superhero who moonlighted as a carpenter, this Thor Hammer Tool Kit would hit the nail on the head. Unfortunately right now it's just a concept design from Dave's Geeky Ideas! When not being carried around for Asgardian cosplay, this hammer opens up to reveal all the tools stored inside. The handle is shared with an actual hammer, which is fastened into a removable tray. Beneath the tray is a reservoir for loose tools and nuts/bolts.